Dream Create Inspire: Paper Makeup Stamps and Quixotic Paperie Blog Hop - 2nd post today, please scroll down for the E.A.D. Designs weekly Monday hop! Paper Makeup Stamps and Quixotic Paperie Blog Hop - 2nd post today, please scroll down for the E.A.D. Designs weekly Monday hop! Today some of the Paper Makeup Stamps Design Team are joining with the Quixotic Paperie Design Team to throw the spotlight on the Paper Makeup Stamps range as part of Quixotic Paperie's 2nd Anniversary celebrations (Quixotic Paperie are the UK online stockist for Paper Makeup Stamps)! As you may be aware - Paper Makeup Stamps is owned by Katie Cotton and to give you a clue as to where the name of her company came from - Katie is a professional makeup artist. Katie has some fabulous artists contributing to her company including Steve Hammond with the Monsters range, Diem Pascarella's Beautiful Day Fairies, Moody Girls by Cynthia Liu and the Retro Cutie Critters by Diem Pascarella. 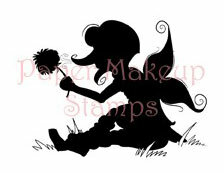 The Paper Makeup Stamps range is available in the UK/Europe at Quixotic Paperie. If you're in the US then you can of course find the stamps at Paper Makeup Stamps direct! As part of the celebrations and the spotlight today, we have a PRIZE GIVEAWAY! Pop on over to the Quixotic Inspirations blog to get all the details and enter the draw to win some fantastic Paper Makeup Stamps and more! I needed to make a Thank You Teacher card for my 5 yr old's JK teacher and my card for today's hop uses the Paper Makeup Stamps Apple Additions and Little Moments Mini Sentiments sets - they were perfect! Extra products used: Bazzill cs, DMCV dp, Distress inks, Archiver's ink, u/k twine, DMC floss, SU button and border punch . Inspiration for my card came from this week's sketch #120 at Card Patterns! Now for some more inspiration! Hop on over to each of the blogs below to see some fantastic Paper Makeup Stamps creations! Thanks for joining us and we hope you are enjoying all the Paper Makeup Stamps loveliness. Great card for the teacher love the apples. Thank you for joining us at cardpatterns. Love this! I need to look at this set! Great card, and so is the design of your blog, love it! Cute card, Stephanie! The apples look great, I like that you added staples as well. Fun colors and great focus on those yummy apples!